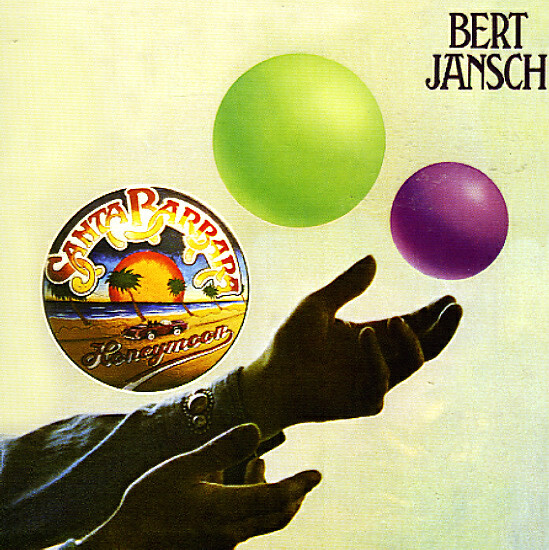 Bert Jansch's second mid 70s effort for Charisma, and also the second title that's an ode to Southern Cali from the Scottish born folk singer/guitar player – and a great one! Although LA turnaround had it's moments of larger instrumentation, Jansch's voice and guitar was a defining characteristic – which is still the case on Santa Barbara Honeymoon, but it's a bit more extroverted in the group instrumentation. Bert's vocals are a bit more exuberant, too, and his impeccable guitar playing gets plenty of space in arrangements that include additional guitars, bass, drums keys, some synths and a little bit of brass. Titles include "Love Anew", "Mary And Joseph", "Be My Friend", "You Are My Sunshine", "Lost And Gone", "When The Teardrop Fell", "Build Another Band", "Dynamite", "Buckrabbit" and more. CD includes 6 bonus tracks: an alternate version of "Build Another Band", plus 5 tracks live from Montreux in 1975. © 1996-2019, Dusty Groove, Inc.